Q: I’m 28 and have struggled with toenail fungus for many years. I just decided for summer I would file the bad ones down and glue on artificial toenails for the days that we go swimming or I want to wear flip flops. They were only on a few days and OUCH my toenails are red and inflamed. I don’t want to take a medication that is hard on my liver. Do you have any tips or advice for me? A: First of all, the redness and inflammation is unlikely to be related to your presumptive toenail fungus. It sounds like you developed an irritant contact dermatitis from something in the artificial nails. It is likely that the adhesive came into contact with the surrounding nail fold, but it can be secondary to a host of ingredients in the product. This is a situation that requires treatment by a dermatologist and you will likely need a topical steroid and, if severe, Prednisone. Also, the initiator (fake nail) will need to be removed. Onychomycosis (toenail fungus) is extremely common and affects 12%-14% of the population. It is even more common in the diabetic and geriatric populations — up to 60%. The first step in evaluating toenail fungus is to make an accurate diagnosis. While toenail fungus is extremely common, only 50% of abnormal nails are due to fungus and it is therefore commonly misdiagnosed. See a dermatologist or podiatrist for a proper laboratory test to confirm the diagnosis. Do not assume that because you have a nail abnormality that you have a fungus. Also, it is important to look for athlete’s foot (tinea pedis), as this is usually where toenail fungus originates. We can treat onychomycosis topically or systemically with an oral agent. Oral agents have more side effects. Topical FDA-approved antifungal therapies have lower efficacy rates than oral agents, but are generally safe with very minimal side effects. Q: I am a reformed viciously fierce nail biter. I have faint black vertical lines in my nails. Is this damage to my nail beds from biting? A: You are describing melanonychia and yes, it is most likely from years of repetitive trauma to the melanin-producing cells in the nail, which happen to reside in the half moon (or lunula) region. Therefore any biting or picking in that area can, over time, stimulate those cells to become activated. When the melanocytes activate, they produce pigment which appears as a black or brown stripe in the nail. This is called benign melanocytic activation. Q: My 5-year-old grandson has both of his thumb nails pulling away from the cuticle at an alarming rate. There’s no pain. He’s been to a pediatrician who says it’s not a fungus and to keep an eye on it. What could this be? A: It sounds like your grandson is experiencing an onychomadesis defluvium unguium, aka nail shedding. This is extremely common in kids who have had a viral illness several months prior. 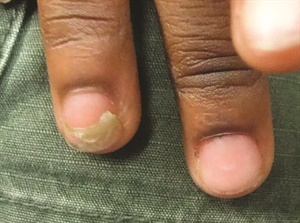 The nail first develops a Beau’s line, which is a horizontal depression in the nail plate due to growth arrest of the nail. Subsequently the nail sheds off. The Coxsackie virus, which causes hand-foot-mouth disease, is a particularly common culprit for this phenomenon. In fact, it happened to my own boys when they were younger. The good news is that the nails always grow back normally! Treatment = patience. Q: I have a buildup of dead skin around my toenails so I’ve been cutting it off, but sometimes I also remove the cuticles. I know that’s a huge no-no but sometimes it’s hard to tell what’s what. Obviously I need to stop cutting the dead skin off, but what other options do I have? A: You are absolutely right, cutting the cuticle is never a good idea. The cuticle is the nail’s natural protective seal. It prevents moisture and infection from entering the nail unit. Instead, soak your feet in a bath to soften the dead skin. Exfoliate with your favorite scrub and use a moisturizing cream that contains urea for that buildup of dead skin. Urea dissolves the intercellular matrix of the cells of the stratum corneum and thus it acts as a very efficient dead skin remover. Most creams containing urea are available by prescription, but there are a few over-the-counter options. Q: Help! My big toenail hurts! How do you get rid of ingrown nails? If your toenail is not inflamed but just somewhat swollen and painful, often cutting the embedded nail away will relieve the pain. Soaking the nail in Epsom salts will also help to decrease inflammation. Prevent ingrown nails by allowing the nail to grow a bit longer than you normally would and remember to cut the nail straight across. If you see significant redness, swelling, and drainage, you should see a physician, as you may need to have a portion of the nail removed and be treated with antibiotics. 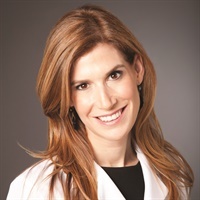 Dana Stern, MD, is a board-certified dermatologist specializing in the treatment of nail disorders, including inflammatory diseases of the nail, cosmetic issues related to the nail, cancers of the nail, sports-related nail injuries, and nail infections. Twitter (@DrDanaStern). Visit her at www.drdanastern.com and www.drdanabeauty.com.